Source: Archiwalne Mapy Pomorza Gdańskiego. Jeziorka (also known as Jeziorken and Kleinsee; now known as Jeziorki; coordinates: 53.48024, 18.19062 [53° 28′ 48″ N, 18° 11′ 26″ E]; population in 2014, 159) is located 18.6 kilometres (km) (11.6 miles) west north-west of Świecie (Schwetz) and 21.7 km (13.5 miles) north-west of Chełmno (Kulm). It is located near the Vistula River. Until 1772 Jeziorka was located in what was known as Royal Prussia (also known as Polish Prussia) in the Kingdom of Poland. The First Partition of Poland in 1772 resulted in the creation of a new province on 31 January 1773, called West Prussia, in which the village was located. Jeziorka was situated in the district (Kreis) of Schwetz until 1920, when it came under the jurisdiction of the Pomeranian Voivodeship of the Second Polish Republic. Jeziorka came under the control of Nazi Germany during World War II until March 1945, when it was occupied by Soviet forces and returned to Poland. In 2014 it was a village in the administrative district of Gmina Lniano, within Świecie County, Kuyavian-Pomeranian Voivodeship, in north-central Poland. Some 13 Mennonites of Dutch origin, from Przechovka, settled there in 1727 to cultivate the land which had been laid waste by soldiers. The Mennonite group increased in 1732 when 12 families of the territory of Culm, persecuted by the Catholic bishop of Culm, also moved to Jeziorka. Like their mother church in Przechovka the Mennonite group of Jeziorka belonged to the Groningen Old Flemish branch. Apparently they never formed an independent congregation, but were in one congregation with their brethren in Przechovka and Konopath, although a church was built in Jeziorka in 1743. They sometimes were financially supported by the Dutch Mennonite Committee of Foreign Needs at Amsterdam. Though in the land leases of 1727 and again 1767 freedom of religion was granted to them, there were many difficulties with the Roman Catholic officials. Besides this the soil was too wet for profitable agriculture. 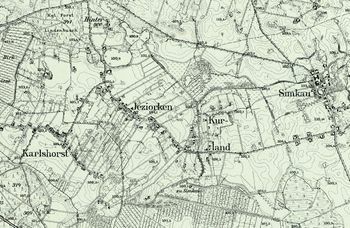 For these and other reasons some of the Mennonites in 1765 moved to Brenkenhoffswalde and Franzthal in Neumark. The 1776 census lists 19 Mennonite families in Jeziorken with the following surnames: Becker, Buller, Jantzen, Koehn, Nachtigal, Ratzlaff, Schmidt, Unrau, and Voht. Again about 1813 a number of them immigrated to Deutsch-Wymysle in Poland. In the 19th century nearly all Mennonites disappeared from this territory. Hoop Scheffer, Jacob Gijsbert de. Inventaris der Archiefstukken berustende bij de Vereenigde Doopsgezinde Gemeente to Amsterdam, 2 vols. Amsterdam: Uitgegeven en ten geschenke aangeboden door den Kerkeraad dier Gemeente, 1883-1884, v. I: Nos. 1091, 1601, 1607, 1702, 1713-1736. Wiebe, Herbert. Das Siedlungswerk niederändische. Mennoniten im Weichseltal . . . Marburg a.d. Lahn, 1952: 30 f., 42, 45, 47, 71, note 6, 81. Wikipedia. "Jeziorki (powiat świecki)." 20 March 2014. Web. 14 September 2014. https://pl.wikipedia.org/wiki/Jeziorki_(powiat_%C5%9Bwiecki). Wikipedia. "Jeziorki, Świecie County." 21 August 2013. Web. 14 September 2014. https://en.wikipedia.org/wiki/Jeziorki,_%C5%9Awiecie_County. Zijpp, Nanne van der and Richard D. Thiessen. "Jeziorka (Kuyavian-Pomeranian Voivodeship, Poland)." Global Anabaptist Mennonite Encyclopedia Online. September 2014. Web. 21 Apr 2019. http://gameo.org/index.php?title=Jeziorka_(Kuyavian-Pomeranian_Voivodeship,_Poland)&oldid=141177. Zijpp, Nanne van der and Richard D. Thiessen. (September 2014). Jeziorka (Kuyavian-Pomeranian Voivodeship, Poland). Global Anabaptist Mennonite Encyclopedia Online. Retrieved 21 April 2019, from http://gameo.org/index.php?title=Jeziorka_(Kuyavian-Pomeranian_Voivodeship,_Poland)&oldid=141177. Adapted by permission of Herald Press, Harrisonburg, Virginia, from Mennonite Encyclopedia, Vol. 3, p. 110. All rights reserved.